Its one he devised some years ago and it went on all sorts of websites, but as those have changed its gradually disappeared ( including a rather splendid audio version, ) He has now located the basic walk description and copy below. He also sent a selection of photos, which illustrate well the nature of this rather splendid walk- one of which gives info about Bert Ward ,the self styled King of Ramblers.and long time Holmesfield resident. In the autumn of 1900, GHB (Bert) Ward placed an advert in a newspaper inviting people to join him on a moorland walk. As a result, on 2 September 1900, 13 people came together for what is thought to be the first ever organised public walk – around the Kinder Scout plateau. 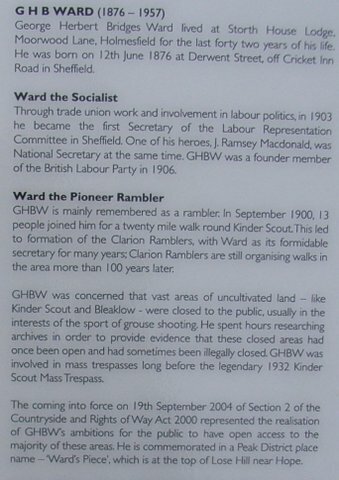 This led to the formation of the Sheffield Clarion Ramblers, a group still going strong, which became the forerunner of the great ramblers’ movements we see today. 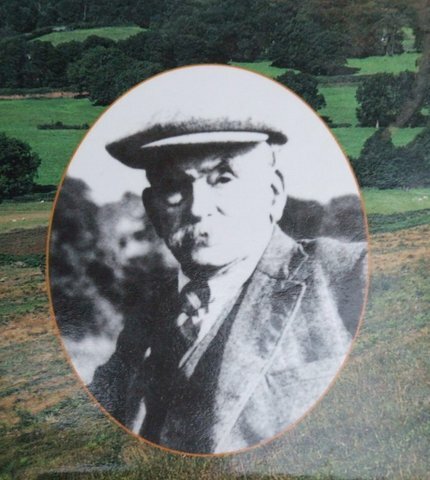 Ward himself became a notable campaigner for access to moorland, which back in 1900 was severely restricted by shooting interests and the gamekeepers who worked for them. Ward lived in Holmesfield for many years, at Storth Lodge on Moorwood Lane. 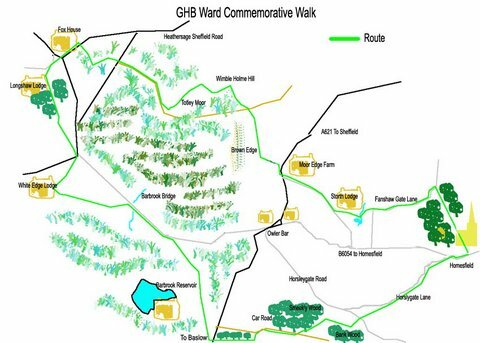 This walk celebrates Ward’s work in establishing the outdoor movement. 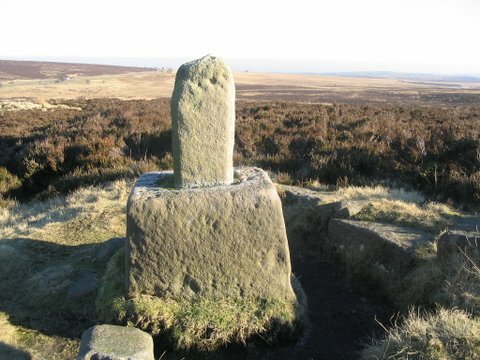 Its route takes you past his former home and out onto the moorland he loved. The walk starts at the bus terminus near the Church, in the centre of the hilltop village of Holmesfield. near Sheffield (Grid Reference SK 322.777); at the time of writing there are regular bus services from Chesterfield and a less frequent one from Dronfield (where there are connections from Sheffield)- There is car parking available at the village hall, a few yards behind the bus terminus; there is also a car park behind the church (not available on Sundays). Organisers of group walks should obtain prior permission to use these car parks. Turn up the hill from the bus stop, past St Swithen’s Church, to the Millennium Garden. There’s an information board here giving more details of Ward and his work. 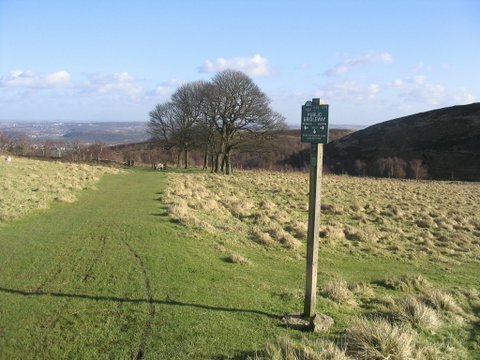 Other information boards have been installed at Totley, Millthorpe and the Shillito Wood car park: these give information about Ward and there are maps of showing the route of this walk, as well as several shorter routes in the extensive Parish of Holmesfield. Total distance is about 11 miles (or 12.5 for people starting at Totley). Much of the route is across open country and the going can be difficult underfoot especially in wet weather. It is advisable always to wear hiking boots and have gear with you suitable for wet and windy weather- it can change quickly. It is also recommended that you have an Ordnance Survey map with you. Most of the walk is on the White Peak map (OL24), though a short section spills over on to OL1 The Dark Peak. It is possible to join the walk by starting at the Cross Scythes pub (and bus terminus) in Totley SK313 800), walking over the fields up to Woodthorpe Hall then joining the main route along Fanshawe Gate Lane. 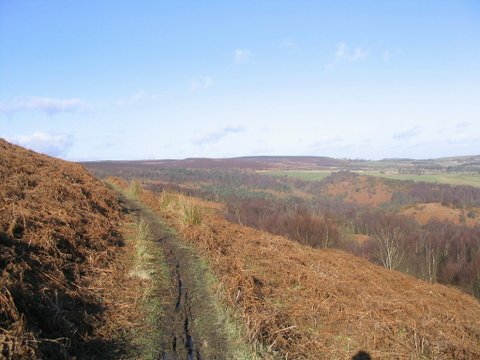 The walk follows woodland paths and quiet lanes before reaching open moorland. 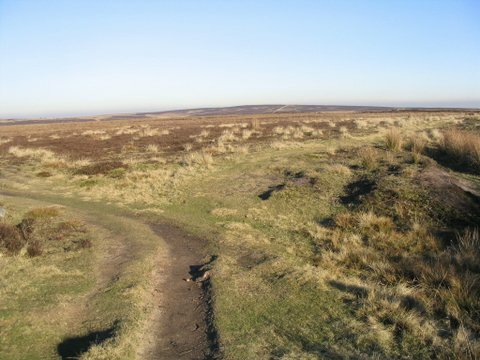 There are paths and tracks leading to Fox House and the Longshaw Estate (National Trust), where there is a pub/restaurant, cafe, and public toilets. It is also another convenient point for people from Sheffield to join the walk – there are 3 buses an hour and car parking is available. There are waymarks – something that Ward himself may have disapproved of! So as to avoid extra “furniture” in remote areas, no new posts have been put in and only existing fences and gateposts, etc have been utilised. So the waymarks are not sufficient to guide you around the route and simply serve as occasional confirmation you are on the right path. There are, though, waymarks at all points where paths meet roads. Walk up past the Church and turn right past the Angel Inn. At the bottom of Holmesfield Park Wood, turn left along the quiet Fanshaw Gate Lane. Walkers starting at the Totley bus terminal (by the Cross Scythes) should turn along Totlay Hall Lane, past the church and follow clear footpath into Gilleyfield Wood. At junction, carry on ahead to bridge over stream and follow path up the hill passing Woodthorpe Hall. Turn right on road and pick up the main route. Follow road past Fanshaw Gate Hall and at top of hill, (SK 308 782) take path off right. Go down and past the fishing pond, turning first right then immediately left on the track. Join Moorvood Lane and turn right. Storth Lodge (SK302 782) is where GHBW lived for many years -if you pause to look at the house, please respect the privacy of the current occupants. Further along the lane, you will see several large stone gateposts; these were originally part of the tollgates, on the turnpike at Owler Bar. At the main road, turn right and cross with care just below Moor Edge Farm (SK 295 787). 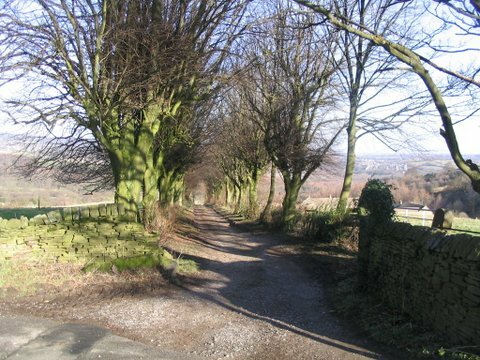 Take the waymarked concessionary path up onto the moor, turning right through the gate, and follow this splendid path, with fine views over Sheffield and well beyond. At fork, keep left and head for 2 rickety wooden posts (SK290 796) and Wimble Holme Hill. Take care at the wide rutted track (the Moss Road), as it’s easy to take the wrong path here. Go straight over the Moss Road and take the narrow path- shown as a black dotted line on the OS map- slightly right which goes down (and very soon over a small stream) and then round to left around the edge of the hill, where the path is now obvious. Carry on down to gate, go through and take the less distinct grassy path, going slightly left and head towards a Peak and Northern Footpath Society metal sign. At sign, turn left and at next finger post (SK288 799), go left again head round flank of hill along a narrow but distinct path veering right. This soon brings you to the remains of a wall; carry on up and across Totley Moor to another wall. Go over the stile in the wall, through gate and turn right on dear track to the road (SK269 804). 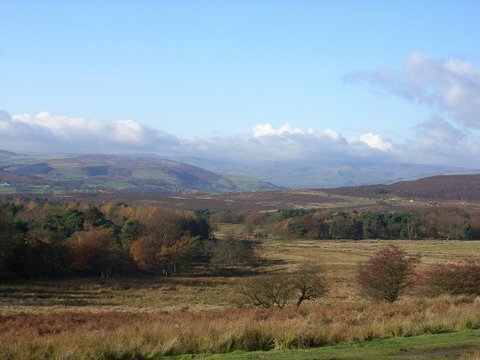 There are superb views across to Higger Tor and beyond to the looming bulk of Kinder Scout. This must have been one of the views that so encouraged GHBW on his (usually very long!) walks in these parts. Path continues across road, with a wet section as you drop down to the main road from Sheffield. Climb stile and go left down pavement to Fox House Inn (SK266 803). 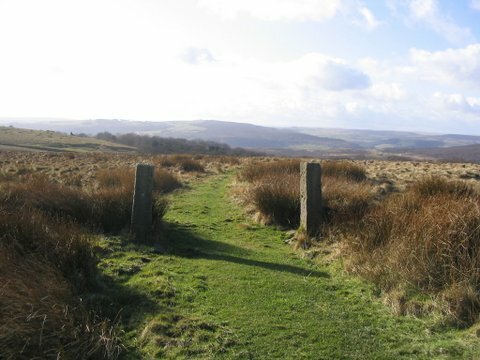 Unless you are tempted to go across for some refreshment stay on your side of road and go straight over the B 6054 at junction, cross very carefully then turn right and left through stone gateway into the Longshaw estate. Follow signs to Visitor Centre, where there is a National Trust shop, cafe and toilets. Walkers from Sheffield may wish to start the walk at Fox House – there are around 3 buses an hour from and to the city centre and there is also car parking available. Should you have started at Holmesfield or Totley and bad weather has set in, this is the only point where there is an ‘escape route’ by public transport. Retrace your steps from the Visitor Centre for a few yards and take path, which goes behind the building (signed Estate Office). Follow this onto the broad green drive towards Wooden Pole and up to gate at road junction (SK269 789); cross busy junction with care and turn right on broad track to White Edge Lodge. 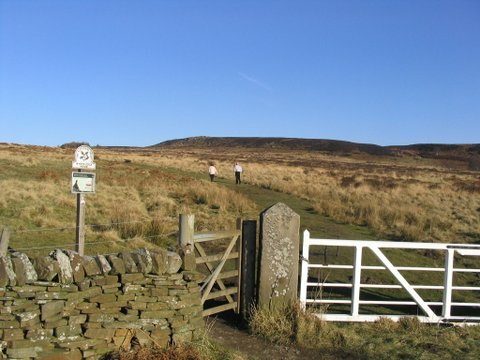 At lodge, leave the clear path and follow path round to left, left again at junction and up onto the edge (SK266 783), Go through gate – the path you want is a few paces to left of the finger post -and head across the flat plateau with its wide vistas. 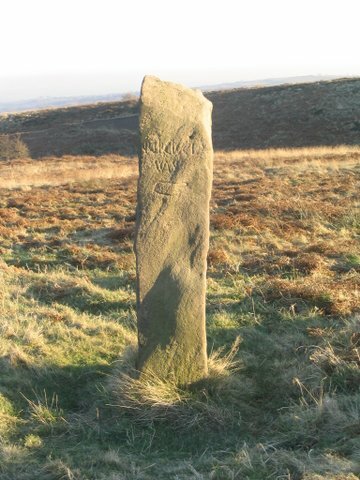 Path passes to left of Lady’s Cross, with its date inscription of 1810 (SK272 782). Now only a stump, it is no longer the marker for travellers it once was. Keep straight on, heading in an easterly direction, towards the road at Barbrook Bridge (SK275 783).